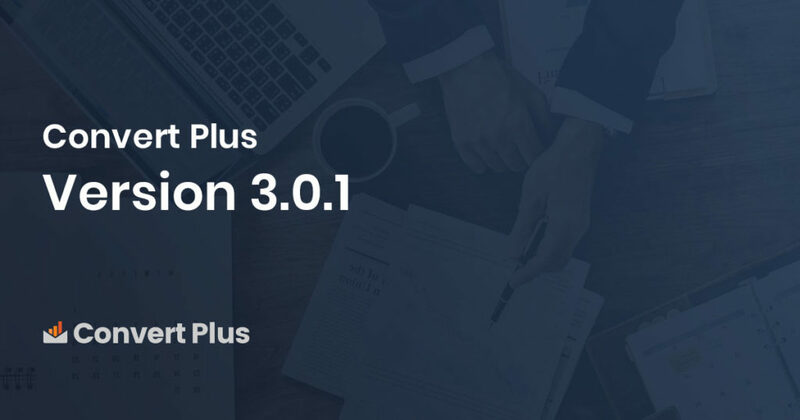 Today we present to you Convert Plus version 3.0.1. The first update after we rebranded ConvertPlug as Convert Plus! You are right! You’ll find some new features, some improvements and fixes that we’ve worked on. Convert Plus version 3.0.1 has features like displaying a popup after a first time visitor refreshes a page n number of times, hide modules from specific user roles, customizable subject and content for email notification and more. Let us take a quick look at what’s hot and new! You can now hide modules from specific user roles! Many users requested us to add this feature that identified the user roles of logged in users and hide a popup from the. You now have a set of user roles you can select to hide the popup when they have logged in to your website. You’ll find this under Behavior -> Target Visitors, when you have enabled the “Show to Logged in users” setting. An inline module can be closed after successful submission! Convert Plus version 3.0.1 comes with an option that closes an inline form after successful submission. You will find this by going to the Convert Plus Dashboard -> Module tab -> Advanced Settings button and scroll down to see the option highlight above. You can display a module after a first time user refreshes the page for the specified number of times! You all know that Convert Plus allows you to hide a particular module from first time users. But, when they refresh the page, they are no more first timers and therefore the popup or module would appear. However, we’ve now added a new option that will allow you to hide the popup for specified number of refreshes. 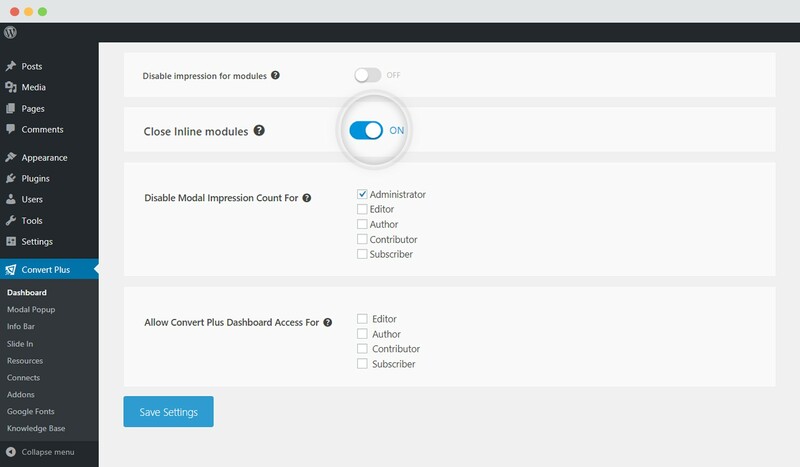 First time visitors will not see the module until the page is refreshed for the specified number of times. 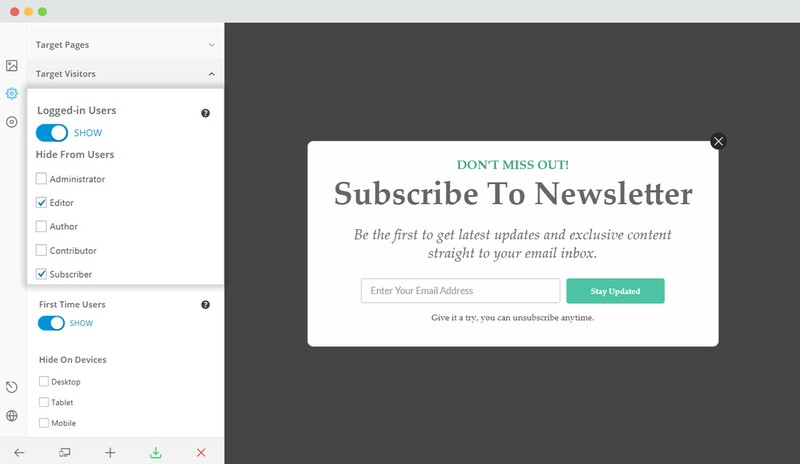 You can customize the subject and content of the notification email you receive! 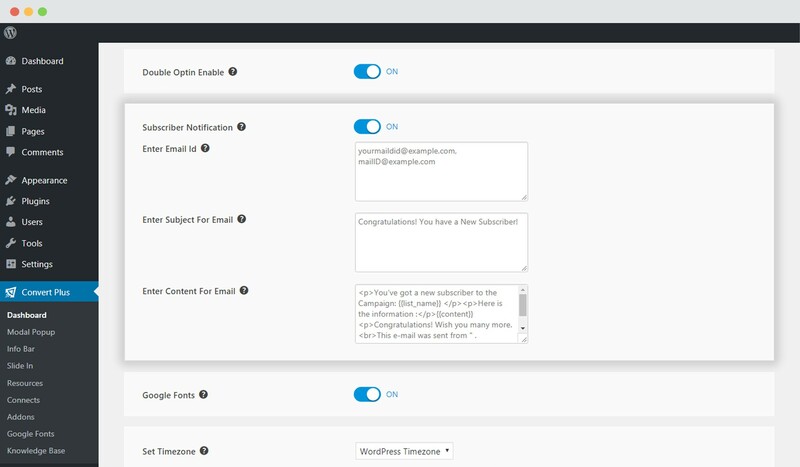 Convert Plus version 3.0.1 allows you to customize the subject and the content of the email you receive after a subscriber has opted in through a subscription form. We have an article that will help you set up subscriber notifications that will be sent to the email ID you set. Apart from these, you will now be able to export all the contact details form all your campaigns at once and use improved Convert Plus as we’ve worked on its performance too! New: Feature to export contacts from all campaigns. New: Feature to close an inline form after submission. New: Enabling or disabling a popup for specific user roles. New: Multiple Selections to delete modal. Improvements: Add localization support for countdown template. Fixed: Blurr text issue on retina display. Fixed: Social media count not working due to API changes. Fixed: Optimizing JS and CSS. Fixed: If search result is empty, do not display pagination. Fixed: If search result has more than limits then only pagination will visible. Fixed: Email notification not working for all connects. Fixed: Reduce Ajax call resources – Count unique impressions only. Fixed: Special characters in inline modules are not visible. The update is released and you are free to give it a try! You can go ahead and update Convert Plus to use the latest features and experience the improvements we’ve worked on. Have any suggestions, ideas or feedback to share? You can post them in the comments below, share it in our Facebook group or simply write to us!